Whitehall Pinecone Nature Hook, French Bronze, 15"
Hang your flower baskets, bird feeders, wind chimes, lanterns, and other hanging accents from the branch of a magnificent pine tree. 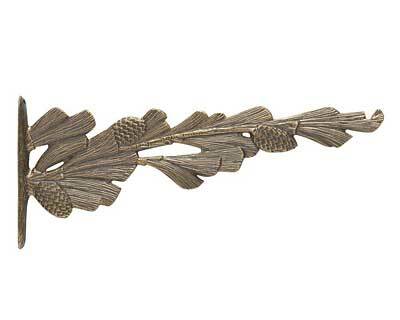 The Whitehall Pinecone Nature Hook features a pine branch motif with impressively detailed pine needles and pinecones covering the branch. The 15" branch forms the arm, making this hook ideal for hanging large items up to 30" in diameter. The hook is cast in recycled aluminum and is coated in a durable, weather-resistant finish to be sure it will complement your home for years to come. Mount this hook to a variety of surfaces using the included mounting screws and instructions. Made in the USA. Whitehall Hummingbird Nature Hook, French Bronze, 15.25"
Whitehall Ivy Nature Hook, French Bronze, 15.25"
Whitehall Dragonfly Nature Hook, French Bronze, 14.25"